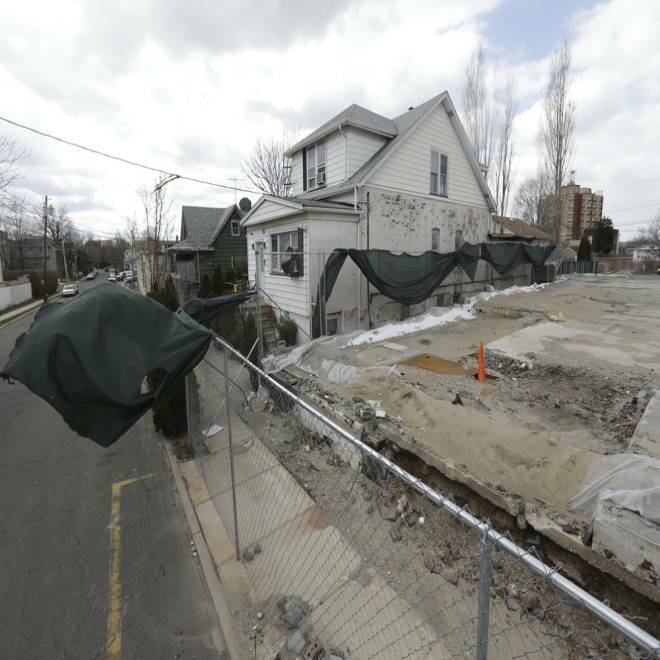 Wind blows through a tarp hanging from a fence surrounding an industrial site in Garfield, N.J. where toxic chromium was spilled in 1983. Scientists plan to check toenail clippings in Garfield, New Jersey, to determine if residents were exposed to a toxic metal made infamous in California by environmental activist Erin Brockovich. Chromium, linked to lung cancer, leaked from the now-demolished EC Electroplating Inc. factory and polluted groundwater in a 1983 incident. Located 12 miles west of New York City, the area is on the federal Superfund list of hazardous waste sites. Some 30,000 people live in Garfield. "Concentrations in the groundwater, et cetera, are very high," Judith Zelikoff, a professor of environmental medicine at the New York University School of Medicine, told Reuters on Monday. In the 1983 incident, more than 3,600 gallons of a chemical solution containing chromium were discharged from a tank at the factory, according to the Environmental Protection Agency. The solution got into the groundwater, which flows toward the Passaic River, about 2,500 feet west of the site. The city's drinking water comes from a different source and is not contaminated. The plume is about three quarters of a mile long and slightly more than an eighth of a mile wide, said Rich Puvogel, a project manager with the EPA. Detecting chromium in groundwater, soil and homes does not necessarily mean that people were exposed, Zelikoff said. "We hope to be able to relieve their anxiety," said Zelikoff, noting that scientists will begin recruiting volunteers for the toenail clippings within the next three weeks. Toenails grow slowly and may help to detect chronic exposure, she said. Very high levels of chromium were found at the factory - approximately 80,000 parts per billion, Puvogel said. Downstream from the site, the levels drop off by several orders of magnitude, he said. New Jersey sets a limit of 70 parts per billion. The residents' exposure would have come from inhaling or touching chromium that had seeped into their basements, especially during flooding. "When the water dries, it also leaves a chromium dust residue," Zelikoff said. Environmental activist Erin Brockovich and her team of lawyers are working to help Louisiana residents displaced by massive sinkhole. WVLA's Kris Cusanza reports. Inhaled chromium is a carcinogen that increases the risk of lung cancer, according to the EPA. Scientists, who became aware of the contamination last year, want to test up to 250 residents, including some who live directly above the plume and a control group living at least three miles away, Zelikoff said. Residents who agree to submit toenail clippings will receive kits containing stainless-steel clippers and instructions. They must be between 18 and 65 and cannot have taken chromium supplements or be smokers. Last year the EPA removed more than 753 containers and drums of industrial waste from the factory and 6,100 gallons of chromium-contaminated water. The building was demolished in October. Next week the agency will start sampling the soil at the site to determine what sources of contamination remain. Erin Brockovich, a law firm assistant turned campaigner, rallied residents in a California desert town to sue Pacific Gas & Electric over a pollution incident - a battle that formed the basis for a 2000 movie in her name starring Julia Roberts.